There are a lot of amateur writers on the typosphere, and I include myself in that list. I think one of the things that most of us have in common is the unrelenting urge to tell a story. We have narrative in our veins that doesn’t just keep us alive, but makes our hearts beat faster and stronger the more we get to give away pieces of it. I came across a series that I think every writer should watch, so let me tell you about something that I felt was quite special. I’ve written about crime television before on my blog and I talked about some the interesting Australian television series that I’d been watching or had watched. Well-told stories that broke away from the almost endless stream of American crime shows that only ever connected with emotions of anger, reprehension and ultimately satisfaction. Shows filled with central characters that we were expected to either viewed with awe, or find awe-inspiring. Crime and punishment is found to be done, and truth and justice can join the american way. The british however do make a good crime drama. But sadly they also tend to fall into the trap of running formulaic structures that have been so thrashed that they have become almost a pastiche. Father Brown anyone? Australian television is doing likewise with the ‘Underbelly’ series – which is running an idea so hard into the very soft ground that it was built on, that it has become a literary multi-carriage train-wreck. Late last year I caught sight of a trailer for a series featuring the actor David Tennant (known for his very popular turn as Doctor Who) one evening, and despite the somewhat bland 10 second look at the series that it offered, I programmed it in the time and came back when it was on. What I watched that night was akin to ripping your own heart out your chest and mashing it into the floor with your foot. Every episode pulled emotions from me like nothing else I have ever watched, and I was challenged intellectually and personally by every episode. As morning breaks in a small but picturesque coastal town the body of an 11 year old boy is found on the pebble laden beach. Soon after the media descend on the town as the boy’s family are thrown into the horrendous emotional downward spiral of grief. And you feel that grief. If there’s anything that you are guaranteed to take away from that series, it is a picture of grief that not only falls over the boy’s family, but the entire community. To call this a police procedural would not tell you anything about this series. The writing doesn’t just encompass the investigation of the crime as that’s only the string that holds the real story together. Instead the series explores themes of victimisation, judgmentalism, community confusion and outrage, media sensationalism and exploitation, guilt and loss – like I have never seen before. The ‘whodunnit’ of this series is almost a McGuffin it matters so little to the real drama of the series. Watching the first and last episodes just to know who it is would offer you absolutely nothing if you were to do that. That said, if you do watch it all the way through, be prepared for an emotional punch that will floor you four hours as you react – not to the revelation of the person responsible, but for the new victim of the crime that emerges. Keep the tissues handy. And that goes for you tough-guys too. Much of this series will leave you bewildered and asking questions of yourself. So often we are used to reading subtle cues in plot points that will lead us to the conclusion, which we can then reflect on and agree with or question how we missed that. Red-herrings are usually just diversions that offer a hurdle to solving the crime, but here they are offered strongly to the viewers as real clues. These are clues, but clues about the limitations of your own perception, and the assumptions we make when we are responding emotionally to the world around us. It throws our subjective nature sharply into focus. The police aren’t glorified in this series as exceptional people that are removed from the situation around them that they are called in to resolve like helicopter experts waiting to drop in and make things ‘right’. Here, they are living people breathing, moving about, and are a part of the same community that they are investigating. In the first episode David Tennant’s character announces to a media contingent while sitting behind table set up in a school hall that “We will catch whoever did this” after asserting “I’d urge everyone, don’t hide anything as we will find out”. And find out they do. Even the hidden secrets of the investigating police are brought out for all to bare. The characters are so developed that the series is able to constructively spend hours weaving a way through their complexities, with the police sifting through it all in order to try and and find a lead in an investigation that they were destined never really to solve, but rather suffer. And that’s what makes this series so different. It doesn’t treat the audience as inanimate or switched-off. It doesn’t feel the need to spell everything out to you. The series has such depth that while the leading characters offer the plot, behind them often is a rich texture of life in a small country town that gives the audience and incredible three dimensional view of the world the story is set in. In fact, it is often important to look over the shoulder of characters just to catch important pieces of information on the context that character lives in. I can honestly say that the writing in this series is so strong, that it will be seen as a textbook example of screenwriting in years to come. It forgoes comforting its audience with entertaining quick and satisfying answers, and instead challenges them intellectually and emotionally. And that is what good writing does. But this goes even further than that. This series leaves you with a different view of some of the elements in the world around you, and makes a very profound statement about human behaviour in times of emotional crisis. This series has such a powerful punch for one reason: the victims – and there are many throughout the series and they aren’t simply silent entities that drive the plot. They in fact are the plot. In so much of our conventional crime drama the victims are little more than a body on the ground, or a series of historical plot points that drive the drama while the central characters struggle to through them. Friends and family of the victim are simply seen in brief scenes where they hold a tissue while they cry, and become plot point delivery tools. You never feel their grief – which is exploited by lazy writers who allow this in order to keep everyone as a potential suspect. 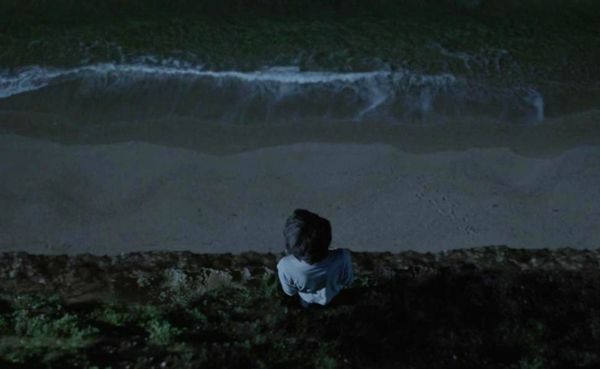 In Broadchurch, the central victim is rarely seen but is talked about a lot, although appears largely faceless when you see him. However the impact of his death creates living victims that are the core of the drama. In a time of wall-to-wall quirky but charismatic police backed up by nearly magical forensic labs that make us feel safe in our armchairs, it is refreshing to have something that is willing to pierce our apathy and challenge us to feel something about the other characters in the show, if not the world around us. Broadchurch aired in the USA last year, but the broadcasters didn’t feel that the cultural differences would make the series watchable to a broad american audience, so it was aired with largely little fanfare. Instead, Fox television is filming an american version of it. While I feel the material is very strong, drama tends to not translate well when re-interpreted for this market using local production crews that are detached from the material. There’s a lot of previous attempts to covert very culturally driven television scripts rusting in the never-to-be-re-run wreaking yard. 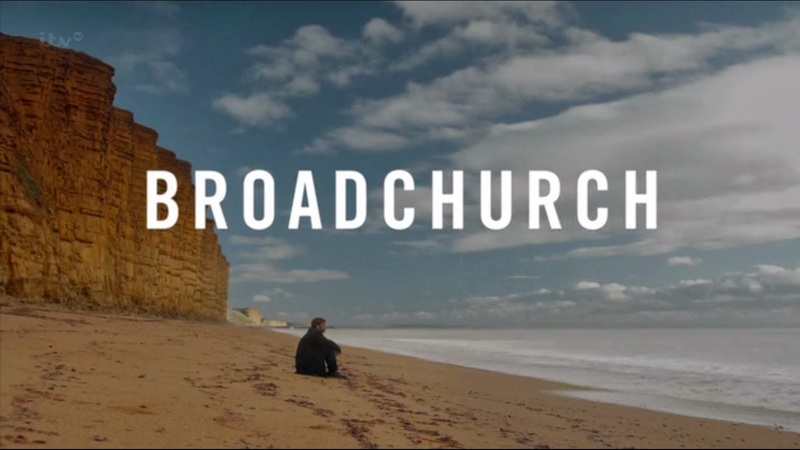 Broadchurch can be found here on iTunes. And I believe it can be found on Netflix as well. Watch it, then grab out your typewriter and write some brilliant writing. April 1, 2014 in Broadchurch, David Tennant, drama, grief, television, writing. The Knick – fiction takes on fact. ← To hell in a Baxter box. The setting was pretty special too. The Dorset coast is generally a place people head for on holiday – and you can't walk along the beach at West Bay without tripping over fossil belemnites and other Jurassic denizens. I have hear that. The geography there is incredible. And the cliffs seem to feature in this show quite symbolically – with their dead-end and unpassable appearance. I saw a little preview, I think on Hulu. Sounds like a very powerful series. Too powerful for me — I am too impressionable when it comes to TV and movies! Hmzz… I like crime series a lot, let's try this one too. Your writings about this show kind of reminds me of The Wire, but then again nothing like it at all. Curious to find out! You know, I've heard a lot about 'The Wire', but I've yet to catch an episode. I'll have to do that sometime. Surely that's not a bad thing. You'd be the perfect person to really get into it. I never considered this because I don't normally watch crime/cop series, but now I may have to give it a try. It's great when you see something that inspires you to want to write. I felt the same way about several of Denis Potter's TV dramas. Hope it gives your writing a prolonged shot in the arm! What's up with the date-time stamp? I'm sure it's April 2nd today! It runs on some time zone in the USA. Silly date-stamp. Well, I can't say there's anything that would discourage you from watching this.The drama is a lot more solid than most police dramas.